In a large soup pot over medium-high heat, heat the oil until it shimmers. Add the sausage, onion, and garlic. Cook, stirring occasionally, until the sausage is crumbled and browned, about 8 to 10 minutes. Add the broth, tomato sauce, diced tomatoes, oregano, salt, and crushed red pepper; bring to a boil. Reduce the heat and simmer, stirring occasionally, until the flavors are blended, about 20 minutes. Add desired amount of noodles; bring to a boil. Reduce the heat and simmer, stirring occasionally, until the noodles are tender, 8 to 10 minutes. Remove from the heat; stir in mozzarella, basil, and the 3 tablespoons Parmesan. While the pasta cooks, thoroughly mix ricotta with ⅓ cup Parmesan. 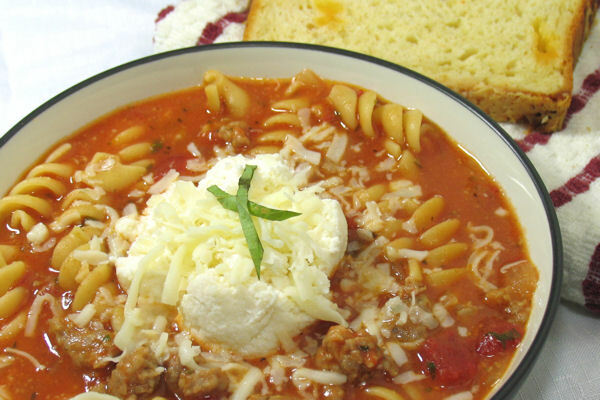 Serve each bowl of soup topped with a few tablespoons of ricotta mixture. 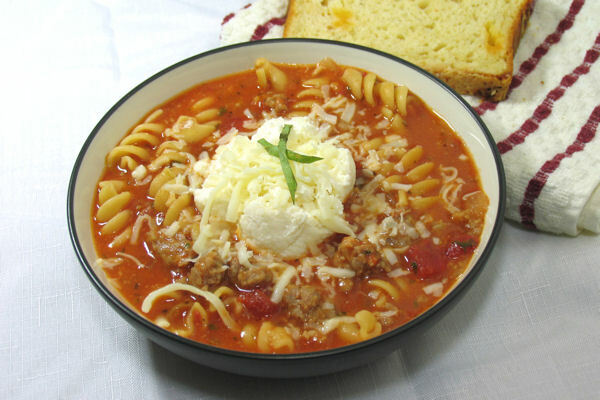 Garnish with additional mozzarella cheese. It’s just the two of us, so I never have to cook for a crowd, but I am a big fan of leftovers or make ahead meals. That way, I have food ready when I get home after a long day, as does my husband, or I have leftovers for lunches at work. Gotta love simplicity during the work week, even if it means a little extra work on the weekend! This meal makes enough to serve a big crowd, or freeze half of it for a later time. I use Newman’s Own Fire Roasted Tomato Sauce for a smoky flavor, but if you prefer, you can use any marinara sauce of your choice. And it’s cheesy pasta… the best kind of pasta there is! Preheat oven to 375 degrees F. Coat 2 (13 x 9-inch) baking dishes with cooking spray; set aside. Place cottage cheese and ricotta cheese in a food processor; process until smooth. Combine cottage cheese mixture, Asiago, Parmesan, garlic, parsley, salt, pepper, nutmeg, and spinach. Spoon or pipe about 1 to 1½ tablespoons cheese mixture into each shell. 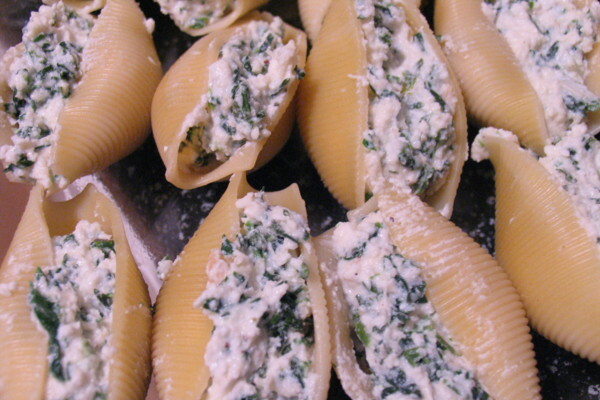 Arrange half of stuffed shells, seam sides up, in one prepared dish. Pour 3 cups, or one jar, marinara over stuffed shells. Sprinkle with 1 cup mozzarella. 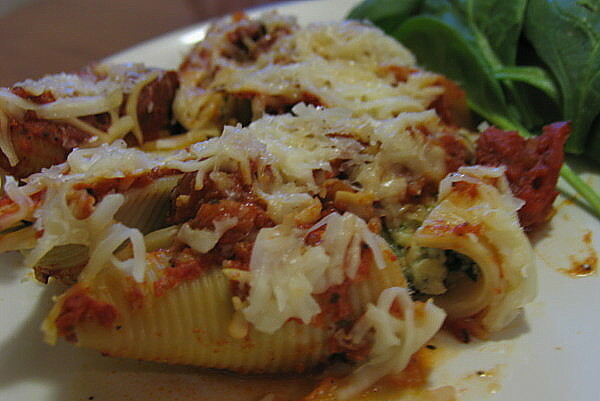 Repeat procedure with remaining stuffed shells, marinara, and mozzarella in remaining prepared dish. Cover with foil. Bake at 375° for 30 minutes or until thoroughly heated and cheese is melted. To freeze unbaked casserole: Prepare the shells in the pans, then cover with plastic wrap, pressing to remove as much air as possible. Wrap with heavy-duty foil. Store in freezer for up to 2 months.